Keo, at age 3 months, started his Nissan LEAF test ride with a yawn, gurgled his approval during the ride, then wisely left the car buying decision to his parents. Grace and Susan Stanat brought their son along for the test drive. They arrived with Keo, baby seat, and stroller. Although three adults can squeeze into the back seat of the LEAF, two babies are another matter. Grace told me of his high-hopes for getting an electric car, because he cares about his kids future and because he works in Silicon Valley high-tech and is excited about our electric future. Nissan is taking about a dozen LEAFs around the country, letting people take a LEAF for a driven. To its credit, Nissan allows people to bring their family. 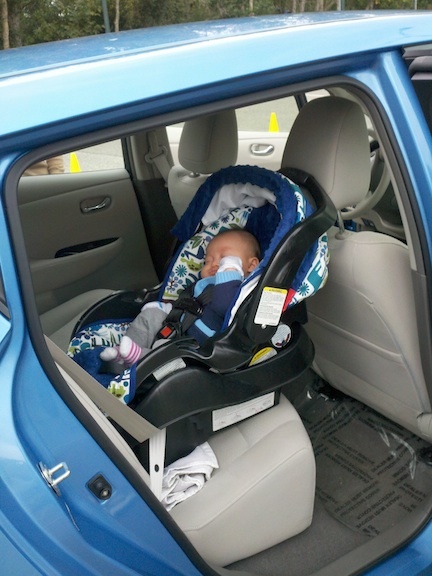 When Grace and Susan were ready for their test drive, Nissan patiently allowed the baby seat to be placed in the back and secured with the seat belt, allowed Keo to be secured in his car seat, and even allowed the stroller to go in the new trunk. Nissan wants people to know what they’re getting and to decide without any pressure if this new compact electric vehicle meets their needs. When I talked with Grace and Susan, it was clear that both cared a great deal about the future for their two children. The parents want to minimize their greenhouse gas emissions and be appropriate role models for Keo and Exie, who also requires a car seat. Living in the university town of Palo Alto, they find that they can walk to many stores, services, and schools. Like many university towns, Palo Alto has bike lanes and transit that connects to regional rail. Grace and Susan have reduced their carbon footprint by sharing a single vehicle. After the ride, Grace and Susan were disappointed. Although the LEAF handled well and meets their range needs, it was a little too small for a couple with two young children. Yes, the back seat will hold the two car seats needed in this family, but the seats press against the front seat. They can already feel their two-and-a-half year old Exie’s kicking in their Honda and worried that it would be the same problem in the LEAF. The LEAF’s trunk, however, was too small for two strollers. 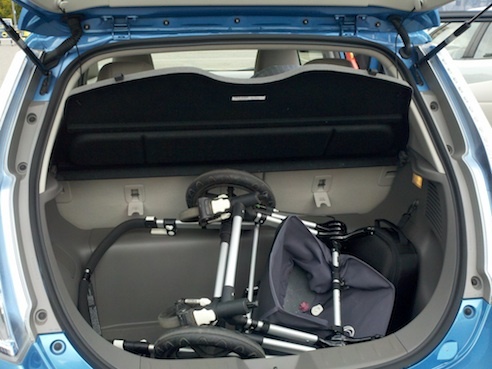 Grace commented, “The trunk was almost too small for one stroller.” This is a common issue in compact cars and smaller. Although Nissan has done an excellent job of packaging the 24kWh battery back under the floor and behind the back seat, it has a small trunk. The 60/40 fold-down rear seat expands cargo space when only one or zero people are in the back seat. Grace and Susan may lease for two years, or until they no longer use car seats and strollers. By the time that Keo is ready to drive, there will be hundreds of choices in electric cars of every shape and size. California’s energy mix will be at least 33 percent renewable, with most smart charging occurring when the wind is blowing or the sun is shining. Thanks to choices made by families like the Stanats, the future may be a little brighter for all of us.